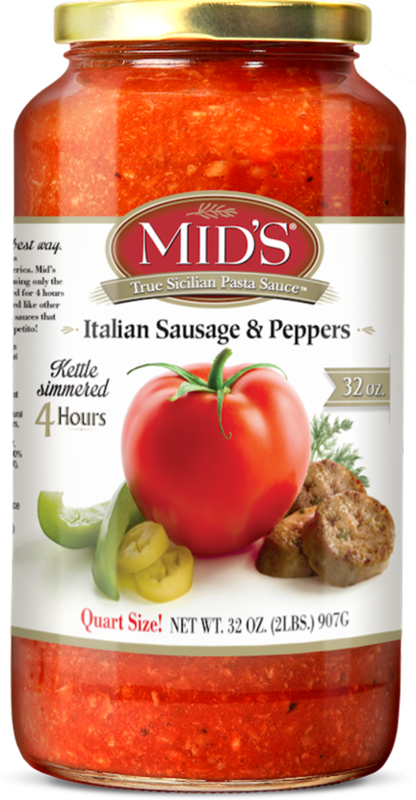 Loaded with the finest, locally raised USDA pork, our all-natural, gluten-free Italian Sausage with Peppers sauce will liven up your favorite recipes. Use as a hearty, spicy pasta sauce or as a delicious and timesaving ingredient in lasagna. As a zesty topping for sausage sandwiches, it’s unrivaled in convenience and taste. Ingredients: Water, Tomato Paste, Italian Sausage (Ground Pork, Water, Seasoning, Whole Fennel Seed, Cayenne Pepper), Tomatoes (Tomatoes, Tomato Juice, Salt, Citric Acid, Calcium Chloride), Mild Banana Peppers, [Fresh Peppers, Water, Vinegar, Salt, Calcium Chloride, Sodium Benzoate (Preservative), Yellow 5], Hot Banana Peppers, [Fresh Peppers, Water, Vinegar, Salt, Calcium Chloride, Sodium Benzoate (Preservative), Natural Flavors, Polysorbate 80, Yellow 5], Sweet Green Peppers, (Sweet Green Peppers, Water, Citric Acid), Sweet Red Peppers (Sweet Bell Peppers, Water, Citric Acid), Sugar, Olive Oil, Salt, Onions, Romano Cheese (Made From 100% Pasteurized Sheep’s Milk, Bacterial Culture, Salt, Rennet), Citric Acid, Garlic, Spices, Paprika.